A killer is stalking the women of Göteborg. Inspector Irene Huss of Göteborg’s Violent Crimes unit is assigned to the case but soon finds she has something else distracting her. Someone is committing minor vandalism around her home . . . her rosebushes are destroyed, a dead cat is stuffed into her mailbox, someone sabotages the brakes on her daughter’s bicycle, an urn is thrown through her dining room window. At his restaurant, husband Krister’s locker is broken into and his wallet stolen. . . .
Did someone want his money or his identification information? Irene’s investigations bring up several men who may be the Package Killer, fitting the description given by witnesses. They also interview the killer’s first victim, the one woman who survived. With her help, they eliminate all the suspects except one: Daniel Börjesson. Daniel is a man with odd mental quirks. He responds best to direct commands and prestige-laden words. In his case, reasoning doesn’t apply. His main alibi is that he doesn’t have access to an automobile or a place in which to hide the bodies. The unit is determined Daniel is their killer, but so far their efforts to prove it have failed. In the meantime, the personal attacks against Irene continue, but the investigations there have been more fortunate. Angelika Malmborg-Eriksson has openly blogged on the Internet of her hatred of Irene, blaming her for her son’s death following an investigation of a fire in which her daughter died. She’s practically demanded someone kill Irene. Is there a connection between Angelika and Daniel—or are the two attacks merely coincidental? Then Police Superintendant Efva Thylqvist is attacked outside her home and left for dead, and the investigation takes on a more desperate and personal aspect. . . . This novel, translated from Swedish, is the ninth in a series, but anyone not having read the others will have no trouble settling into the story. Though some of the Swedish names and places may give American readers a moment of difficulty, this in no way detracts from the story itself and won’t hinder its reading at all. In spite of the fact that the episode with Angelika seems merely thrown in as a bit of a red herring, the plot is thorough and detailed. 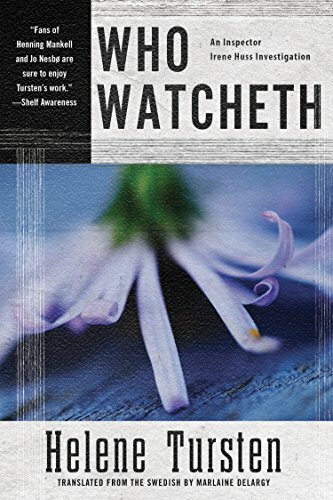 While it deals with violent crimes, Who Watcheth isn’t particularly gruesome in its descriptions. A tale of a detective determined to discover the true perpetrator of the crimes while working through her own personal problems, its ending reveals another reality . . . no matter how much the adherence to duty, sometimes even an officer of the law may become simply a human being when it comes to meting out justice.